I rarely share client related work because of sensitivity, I don't want to be a shill, and concern I may reveal too much with my brutal honesty, but I wanted to share some work we did for the new 2010 Ford Fusion + Fusion Hybrid. Our idea was to get people to share their small environmental behavioral tips to collectively effect positive change, emulating the new Ford Fusion Hybrid’s SmartGauge Cluster with EcoGuide that help aid the driver’s behaviors. The hybrid model has a display on the LCD instrument panel that grows or sheds leaves depending on how ‘green’ your driving is in real-time. 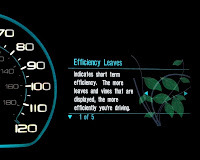 As the driver changes their behavior by going easy on the gas from a light more leaves grow on the vine’s dash display. See this video to learn more about the feature. 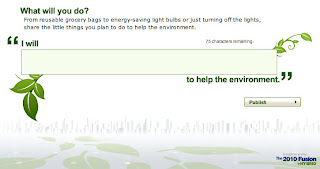 Following this same concept of small changes leading to improved environmental impact, the new Ford Fusion Facebook application You Speak Green asks participants to leave their own behavioral change that can then be shared within their social network and across all of the application’s participants. Collectively ideas are spread that can be ranked by others and even adopted. Some common ideas like using reusable grocery bags, using a coffee mug instead of disposable cups, or turning off the water while brushing your teeth are shared for others to consider. Other ideas one may not have thought of could be learned from others and collectively adopted for the greater good. All of this is a light-touch to communicate positive change and showcase the thinking behind the Fusion Hybrid’s own design. People are brought to an application tab of the Fusion Fan Page and there is some communication that this is brought to you by the Fusion and one can Friend the Fusion. For those of you who decide to install the application, I’d be curious to know what you think. Please share your comments on this blog. UPDATE 10/15/2009: Our team won a JD Power Catalyst Interactive Advertising Award for Social Media.